This page describes the event of the Flood and the evidence that exist today that such an event occurred in the past. It is the key to correctly understand the geology of the earth. The true interpretation is not that the ‘present is the key to the past,’ as the evolutionary uniformitarians would have us believe. Instead, the Bible is the key to the past. We do not see present processes occurring today that would lay down the fossil record. However, we don’t need to. We accept by faith that God created everything and that there was a global flood in the past (2 peter 3:3). The Bible is the key to properly understanding the past. Our faith is not blind. Using the Bible as our key to the past, we can see that the evidence coincides with the Biblical view. For more on the Biblical arguments for the global nature of the Flood - click here. Man was clearly being judged for his wickedness. However, God was going to spare Noah, his family, and two of every kind of animal (seven of some). Many today in Christian circles (theistic evolutionist and progressive creationist) are stating the flood of Noah was a local flood. This position is clearly not Scriptural. § Gen. 9:8-11 – God would have been making the covenant with Noah to never send a local flood. Other scriptures on the flood include: Job 12:15; 22:16; Ps. 29:10; 104:6-9; Is. 54:9; Matt. 24:37-39; Luke 17:26,27; Heb. 11:7; 1 Pet. 3:20; 2 Pet. 2:5; 3:5&6. Believing the flood was only a local event is simply not believing the Bible! 1.4 Where did the water come from? Gen. 7:24 “And the waters prevailed on the earth one hundred and fifty days.” These verses show that although it rained for 40 days in which the water level appears to have peaked, the water continued to cover the earth for 150 days. They were on the Ark for one year and 17 days. Many believe that there were underground pre-flood water reservoirs that were part of the great fountains of the deep that burst forth. There is still evidence of some water trapped deep under the surface of the earth. Additionally, part of the breaking up of the fountains of the great deep may have been due to some asteroids impacting the earth. The pre-flood earth is seen to be a single land mass (Gen. 1:9&10), but apparently during the flood, the singular land (earth) was broken up into separate land masses. This is clearly seen by the scares on the ocean floors created from the sliding of the continental plates (see picture later in this study). § Strata boundaries: The boundaries between strata are straight and abrupt, unlike what would be expected if each layer of strata represented millions of years, as evolutionists teach. Where are the signs of erosion or meteorite impacts? 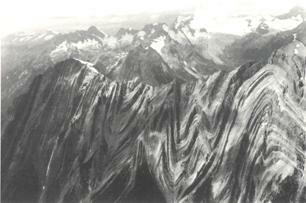 § Widespread strata: Continent wide sedimentary layers are visible. What would cause this? A global flood. 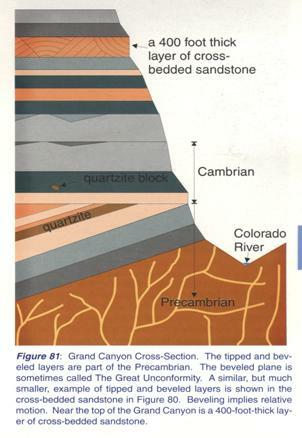 § Sedimentary: The strata are mostly sedimentary. This means that each layer was laid down by water. What evolutionary model would support this evidence? That the continents were raised up and down hundreds of time to create each sedimentary layer over millions of years, and yet the boundaries between the strata are straight and abrupt. This is hard to believe! No evolutionary based uniformitarian model can properly answer the fact that the layers are sedimentary layers with abrupt boundaries. The calm sea description just does not suffice. 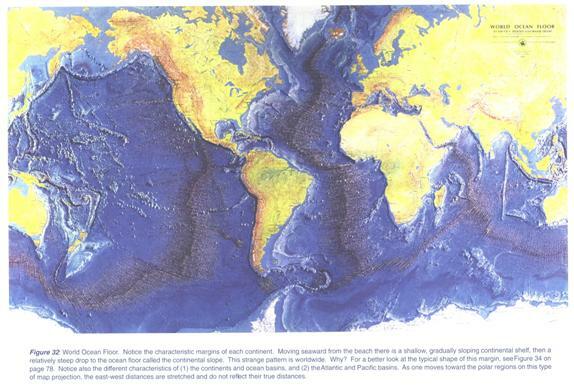 § Proof that oceans covered the continents: Sea life is found in strata all over the continents, even at high elevations and the tops of every major mountain range. § Rapid burial: Evidence all over the earth that rapid burial of plants and animals has occurred. Even extremely fragile organisms have been found fossilized. Famous Ken Ham saying “Billions of dead things buried in rock layers laid down by water all over the earth.” Yet, when animals die today they are quickly scavenged by other animals. What would leave so many completely intact animals within the fossil record? Only something catastrophic in nature. § Lack of transitional Forms: Evolutions theory of one thing evolving out of another would mean these transitional forms would have to be visible in the fossil record. However, there is a major lack of these transitional forms in the fossil record. Many evolutionists are now admitting to this fact. § Punctuated Equilibrium: Many evolutionists are now stating the reason we cannot find transitional forms in the fossil record is due to species not changing for long periods of time. But when they do change, they change so rapidly that we do not see the transitional forms in the fossil record. This is completely against the Darwinian view of evolution, which states that natural selection plus mutations, plus millions of years creates the mechanism for evolutionary change through very slow and gradual processes. § Rapid Fossilization: Fossils have been shown in the laboratory to form rapidly. It simply takes rapid burial, ground water, and minerals. All of these would have been present in a global flood. Get Creation magazine from AiG for a steady flow of examples of such fossilization occurring rapidly. See the fossilized finger below from the Glen Rose Creation Evidences Museum. 20 different medical scholars analyzed the finger and attribute to the fact that it is an actual human finger. 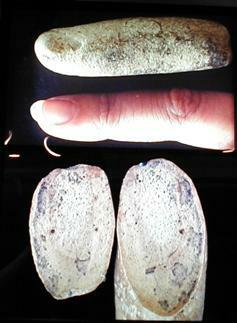 You can see the fossilized cartilage and blood vessels from the cross sections. 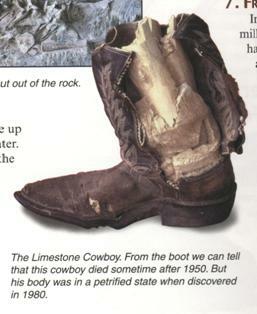 Illustration: Fossilized foot in boot. Wow, they had boots millions of years ago! § Rapid Erosion: evidence such as the Grand Canyon shows erosion can occur quickly. Furthermore, the amount of soil at the deltas of the world’s largest rivers does not support an evolutionary scale. For example, the amount of sediment for the delta of the Colorado River just does not support the story that the Colorado River cut the Grand Canyon. At the current rate at which sediments are being carried downstream, the deltas would only be thousands of years, and not millions. Also, stratification is observed today at the mouths of river deltas. These strata layers on being laid down concurrently. § Continent Erosion: The continents are eroding into the sea too fast to fit into evolutionary models. At the observed rates of continental erosion and the millions or even billions of years which the evolutionists attribute to them, the continents would no longer exist. They would have all eroded away given today’s observable erosion rates! § Mountain range locations: The major mountain ranges are parallel to the Mid-Atlantic Ridge, indicating the direction from which the continents slide apart during the flood. § Folded Rock. This was the result of the sliding continents starting to catch on one end and then being buckled up from the pressure of the sliding land mass behind it. § Polystrate Fossil – Fossils that cross two or more sedimentary layers (strata). How could these trees have been fossilized if it took millions of years for each strata to form as evolutionary timeframes dictate? Yet, these are found on every continent all over the world. Some eroding mountainsides have exposed thousands of these together covering large numbers of strata which clearly had to be buried at one time. Many of these trees also exhibit the abrupt breaking of their root systems. They were buried in the flood. § Oil, Natural gas, coal – the fossil fuels that we use today are remnants of the flood. They are the remains of vegetation and animals buried during the time of the flood. The post flood earth is now buried by as much as two miles of water born sediment. Note: Laboratory test have shown that buried plant material and moderate pressure and a little bit of heat can create coal in weeks, not millions of years. § Tropical remains at the poles: Tropical remains are found frozen at the poles, including Northern Alaska and Siberia, such as the trees shown below that washed up off the shore of the northern coast of Siberia during a summer period. There are no forests containing these types of trees and vegetation even close to these areas. 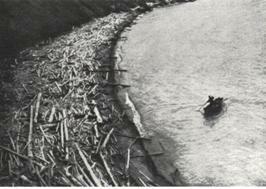 These are clearly remains of the flood that had been frozen or buried until they were washed to shore. Additionally, palm trees, pine trees, and tropical foliage in great amount are found frozen in the northern regions. The geologic column stands as a record of God’s judgment on a world that had gone bad. God will one day judge the world again with fire. Are you ready? Wonders of Creation series: The Geology Book by Dr. John D. Morris, pg. 40.